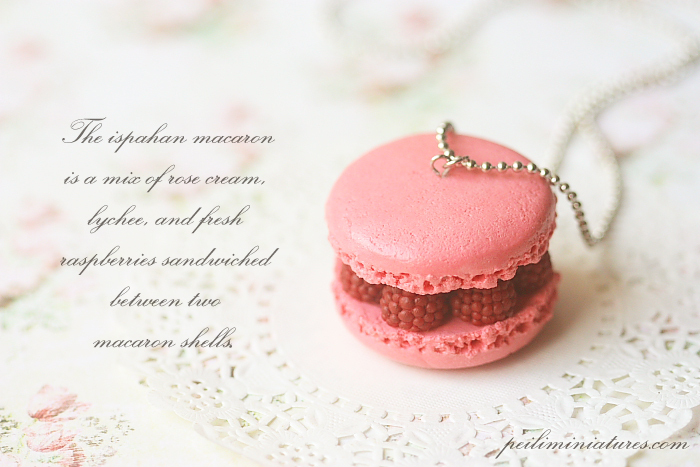 I'm so excited to bring you a new creation of mine - the Ispahan Macaron Necklace! I love this new necklace so much, and hopefully you do too! Before assembling this together, I've been thinking if I should offer this as a jewelry first or as a fake food prop first, but now that I've turned it into a necklace, I am quite sure there would be a few macaron fans who would love to own a life size fake ispahan macaron too, so that would be something I would be working on shortly as well :) To make the macaron wearable less "bulky", I've used the normal macaron shells and kept the width around 4cm. 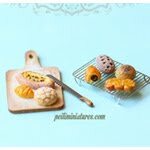 In reality, it seems that the ispahan macaron is larger than the normal macarons - the shells are 7cm wide. So that would be my next challenge! This can be found in the Food Jewelry section of my shop here. Continuing with making some life size fake raspberries here. The front view of the fake raspberry was even more tedious to make. In fact I thew the first one away while it was done halfway because it didn't look realistic. This is my second attempt, and am more pleased with the result! This is my first ever attempt making life size fake raspberries for a new fake food project. Because it was my first time, I found it tedious making the first raspberry. Everything is hand made. I made it while watching a movie, or rather more like listening to it. I timed myself and it took probably an hour to make about 3 raspberries. But I discovered that the second and third raspberry took less time to make, and as I practice more, it gets easier. I can't wait to assemble the whole thing, so I will persevere. I need MORE, so I'm going to make more raspberries now! I'm loving this soft colour scheme recently. My latest dollhouse miniature spring bouquet consists of several flower types. A soft delicate look is what I wanted to achieve. Last week, I ordered some more new colours, which I am excited about. I'm so looking forward to try them out and make some more colourful bouquets. I hope you love this spring bouquet too. Had my very first try at hand making a heart shaped Ispahan Macaron using air dry clay. It was so fun to make, with the help of the mold here. I'll show a picture when the top decoration is done. I love bringing real life into the miniature world, and making wood words decor in dollhouse decoration is one fun thing to do. In the next few days to come, I will be releasing a few more fun words that I'm sure a lot of you will enjoy. This, I'm sure will be a delight to many who loves the baking theme. 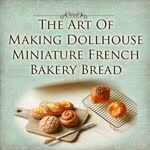 Fun to put in your dollhouse miniature kitchen or bakery. 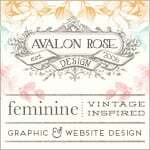 Maybe even for your scrapbooking projects. Paint them in any color you wish, or even distress it for an antique look. 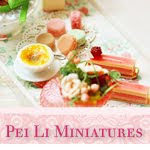 They can be found in my shop, under Dollhouse Miniature Supplies here. I made these dollhouse buttermilk pink rose cupcakes recently. Tried my hand making the roses as delicate as possible and am really pleased with the result. It's Sunday over here today, and I'm going to take it easy. Have a terrific weekend too!